Gmail for Work, an app from Google’s G Suite, is a SaaS tool that can take your business’ emailing, calendaring, teamwork, communication, and document creation to the next level. Learn about more G Suite below, and find out how it can benefit your business. Domain.com makes it easy to add G Suite for Business to your domain name. You’re probably all too aware that, these days, using a personal email for your business is not always the best way to hook in customers. Similar to having your own website, a professional email address grants a person or business legitimacy, signaling to customers that you’re a real and trustworthy operation. With Gmail domain integration, you can use the Gmail system for all communication from your custom domain email address. This way you get to have the best of both worlds, a professional email address that matches your domain name. 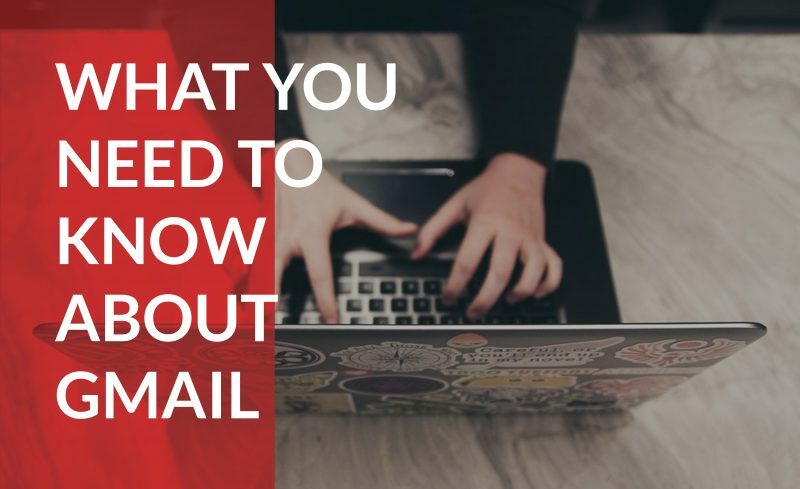 Business email aside, you likely already use Gmail’s complimentary service and apps on a regular basis for emailing or online writing purposes. While these provide plenty of horsepower for anyone who is using Gmail personally, for businesses, some of the basic features of Gmail for work are lacking or limited, especially when compared to Microsoft Office 365. Gmail for Work is the paid version of Gmail and was designed specifically for businesses of any size. With Gmail for Work and Domain.com, you receive a package of products and cloud-based services that allow you to communicate and collaborate seamlessly from anywhere on any device. Your company is armed with an intuitive and fantastic set of Google tools meant to improve communication and optimize workflow. At their essence, the G Suite tools can be broken down into four categories: communicate, collaborate, store, and manage. Gmail – The most obvious feature of Gmail for Work. A paid subscription via Domain.com grants you email access to your domain. Depending on the G Suite package you choose, this email address allows users to store data and messages, anywhere from 30 gigabytes to multiple terabytes. Calendar – This time-management and scheduling service lets G Suite users create and share a schedule, meeting, or pitch. With it, teams can plan out delivery schedules and due dates. They can also highlight important dates or times. Since it is cloud-based, you can share your calendar with other people at the company, allowing them to check your schedule for availability. Hangout – Google’s powerful video chat and messaging service lets ten users participate in a single video conference. Hangout is easy to use and far more reliable than a similar product such as Skype. For G Suite enterprise, as many as 25 people may join a low-resolution video conference. Meet – Recently, Google rolled out Meet, a beefier version of Hangout meant for medium to large businesses. This allows anywhere from 50 to 100 users to participate in a video conference call simultaneously. This version allows for phone dial-in, recording of the meeting, and high-resolution video. Docs – Docs was Google’s take on a Microsoft Word in the cloud. As a result, documents can be edited, disseminated, and altered rapidly without any fear of losing files. Documents can be shared in either edit mode or view-only mode, so only the right people can make modifications to the material. Docs also work seamlessly with Microsoft Word, allowing you to convert a word file to docs, or vice versa. Sheets – Google’s version of Excel, this easy to use but extremely powerful spreadsheet service lets users create charts, graphs, tables, and formulas to both enhance and simplify your spreadsheet compilation. The dozens of templates allow a person to dive in immediately no matter what device they’re using. Open, create, and change your spreadsheets from wherever you work. Forms – Forms allow a person to gather and optimize information, whether big or small. You can start an office poll, gather up personal email addresses, or start a survey. Forms help you get answers as quickly and concisely as possible. With a variety of templates and options, from multiple choice to fill in the blank, your Q&As can be set up in such a way as to provide you with the best and most pertinent information. Thanks to smart organization, responses are neatly compiled for optimal analysis. Slides – Slides is Google’s answer to PowerPoint. This excellent tool helps you give a pitch, create a presentation, or compile a slideshow. Make impactful presentations and tell inspiring stories anywhere, anytime. Sites – Google’s structured Wiki and Web page creation tool lets any user with access to G Suite create simple websites. With previously unprecedented cloud storage , store lets Gmail for business users create, edit, query, and renew files from wherever. Smart tools make it easy and straightforward to manage and secure your users, devices, and files. Mobile – Gmail’s mobile app and suite features can be accessed from any smartphone or tablet, whether they are running Android or iOS. Basic – $5 per month per user plan that gives users 30 GB of data storage space along with various G Suite tools. Business – $10 per month per user plan that gives four or fewer users 1 TB of data storage, and five or more users unlimited storage. Business comes with enhanced office suite with additional features such as audit reporting, cloud searching, eDiscovery, and access to Google Vault. One of these plans should be ideal for your business, though the vast majority of companies find the sweet spot of price point and features with G Suite Business. These plans can be paid either monthly with the flexible plan, or annually with the fixed plan. Although the annual plan saves some money in the long run, the flexible monthly plan allows a company to add or remove accounts, and only pay for the accounts that get used. The flexible plan also gives you the ability to cancel a subscription if desired, whereas, with the annual plan, you pay for a year and get a year, whether or not you use the service. Set up your domain name to be hosted by Gmail – Doing this, you get to use Gmail for your Domain.com email inbox. You can also make custom emails for anyone who works for you or to delineate various aspects of your business such as press@ourbusiness.com, or help@ourbusiness.com. With Domain.com you do not need to toggle between separate mail systems or names, simply integrate your email with your domain. By doing so, you no longer have to search a domain name or register individual accounts. This benefits your company by allowing for quick domain ID, 24/7 customer support, and a custom Gmail for your domain. Create a signature – Having a personalized signature at the bottom of your messages makes every email look more official, and ties you or your employee closer to your business in the mind of your customer. Utilize the labels feature – You can label and categorize your inbox in order to simplify inbox navigation, or to highlight important messages or contacts. Take advantage of Customer Support – Google provides round the clock customer support for paying members. If you have any questions, queries, or problems, they’re a brief call, email, or message away. Group email addresses – A nifty feature of Gmail for Work is that you can catalog people or departments into groups for easier messaging. By adding the entire marketing team to a group, you no longer need to find and enter every email address. Before you can start rolling with Gmail for Work, you must verify and register a domain to confirm that no one else is using that domain without your expressed permission. With Domain.com, verification is simple, letting you get to work in no time at all. Have your Domain.com login info at hand. If you have forgotten, you can easily reset your password at the login section. Search for Domain.com’s Domain Name System settings. Copy that information and paste either the MX, TXT, or CNAME record of the DNS settings. Another option available to you is adding the meta tag or HTML file. This verification record does not affect your Gmail or website. Once you have this information, follow the Gmail Setup Wizard to verify the domain. If you have trouble accomplishing this, feel free to contact Google Cloud Support which comes with the G Suite subscription. You can also reach out to the team at Domain.com if you are having difficulty finding the MX, TXT, or CNAME records. Gmail for Work is a powerful cloud-based tool that can help take your business capabilities to the next level. Thanks to its fantastic mailing features and real-time document collaboration, you can crush your work from anywhere at any time.